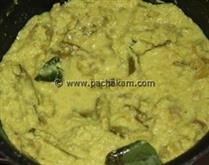 Dry roast coconut, dal, 2 small onions and curry leaves. When evenly browned(this is very important), add chilly, coriander and turmeric powders. Grind it to a very fine paste. Saute the vegetables in oil, until cooked soft. 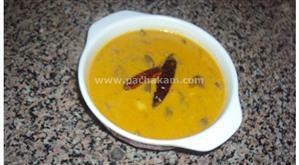 :- If you use onions/lady`s finger/bitter gourd, it tastes more good if sauteed until brown. 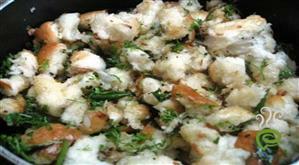 :- If fish is used, I suggest cooking with small amount of water rather than frying. Add tamarind paste to veg. Add the ground masala paste, enough water and salt to taste and simmer in low fire. 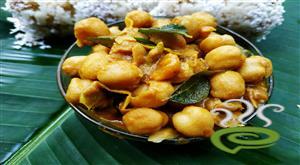 Season with fried small onions, dried chillies and curry leaves. 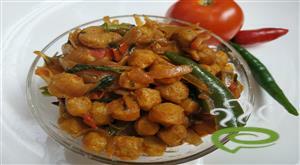 :- Add 4 - 5 pepper corns to masala if using fish. *For vegetables, you can use either small onions only, or brinjal/eggplant or small onion and lady`s finger or mixed veg like tomato, carrot, kovakka, drumsticks or dried fish like nettholi and small onion or fresh prawns and onion. or mushroom and onion what ever ingredients you use preparation method is almost the same. I have tried with almost all of those combinations and always it turned out tasty. This is really a nice recipe. I am also putting the image for it. 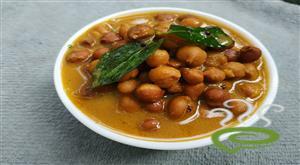 You need to fry cocunut to nice dark color to get the taste and color for theeyal. 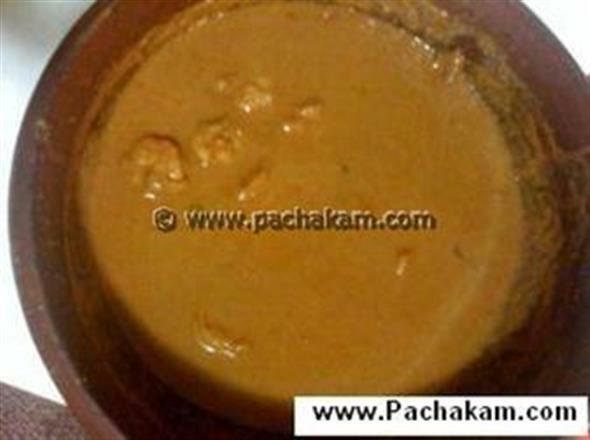 The tamrind paste doesnt need to be 2 tblspoon. 2 teaspoon is enough. 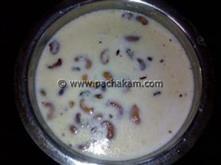 Thanks for the nice chemmeentheeyal recipe. 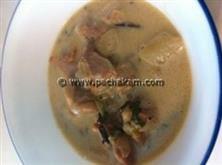 I have put the chemmeen after the onions have turned very soft and put the tamrind on top of prawns.